What would an #OpenData future look like? This is the fourth in a blog series discussing how the future affects data infrastructure. The first describes why we are considering three potential data futures, the second explores the locked-down future, and the third explores the paid future. What will our ‘data future’ look like? Well, there are three possible directions in which it could turn: a locked-down future where data collection and use is tightly restricted, a paid future where data is licensed for money, and an open future where data is made as open as possible. At the Open Data Institute, we like to describe data as roads: roads help us navigate to a location, data helps us navigate to a decision. While the locked-down future has missing roads and locked gates, and the paid future is dominated by toll booths, the open future has roads that we can all use. 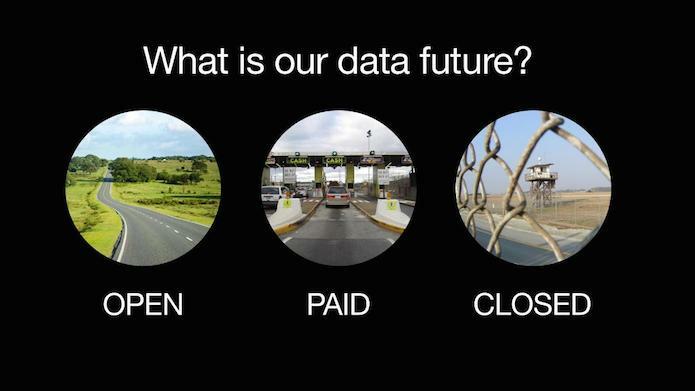 Both the paid and locked-down futures are more limited in their use of data than the open future. Where they create less value and only some can benefit, the open future creates a virtuous circle from which everyone can benefit.